Ferron, Jean. "Squirrel". The Canadian Encyclopedia, 12 July 2016, Historica Canada. https://www.thecanadianencyclopedia.ca/en/article/squirrel. Accessed 24 April 2019. Squirrel, common name for family (Sciuridae) of rodents, comprising 262 species, found in North and South America, Eurasia and Africa. Primarily herbivorous, squirrels sometimes eat insects, eggs and even small birds (Corel Professional Photos). The flying squirrel has a skin fold along its flanks and attached to its feet that enables it to glide (Macmillan Illustrated Animal Encyclopedia). Most ground squirrels hibernate, while tree squirrels are active year round (Corel Professional Photos). 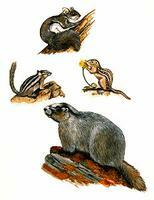 Northern flying (top), least chipmunk (right), thirteen-lined ground squirrel (centre-left), and hoary marmot (artwork by Jan Sovak, 1989). Squirrel, common name for family (Sciuridae) of rodents, comprising 262 species, found in North and South America, Eurasia and Africa. 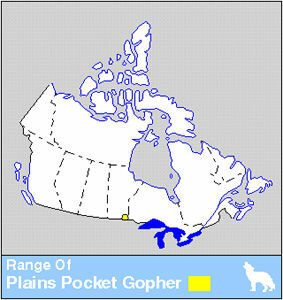 Twenty-two species occur in Canada: 6 are tree species (Sciurus carolinensis, S. niger, Tamiasciurus hudsonicus, T. douglasii, Glaucomys volans and G. sabrinus), the latter 2 flying squirrels; and 16 are ground-dwelling species, of which 6 are ground squirrels (Spermophilus richardsonii, S. columbianus, S. parryii, S. tridecemlineatus, S. franklinii and S. lateralis), 5 are chipmunks, 4 are marmots and 1 a prairie dog. Squirrels have 4 toes on forefeet; 5 on hind feet. Tree squirrels have bushy tails and small feet; ground species have less bushy tails and more robust forefeet. 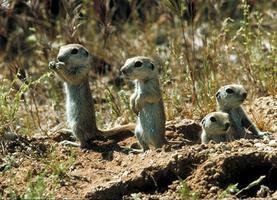 Ground squirrels and chipmunks carry food in internal cheek pouches. The flying squirrel has a skin fold along its flanks and attached to its feet that enables it to glide. 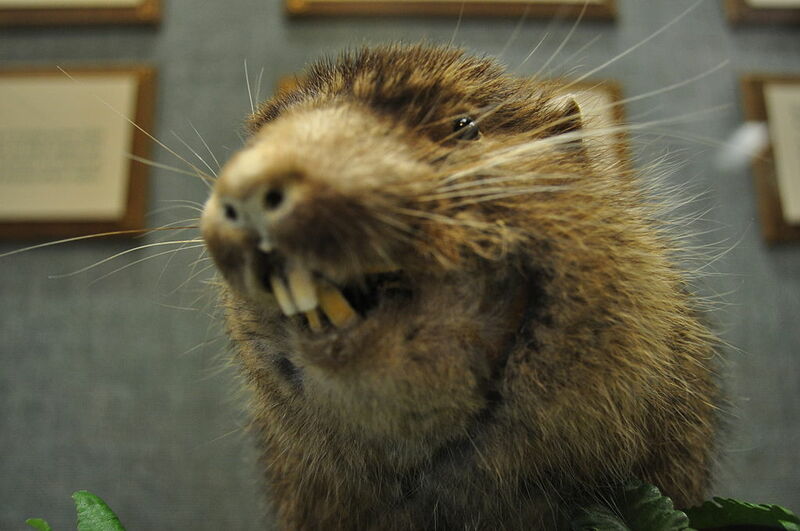 There is great variation in size: the largest Canadian squirrel, the hoary marmot, is 80 cm long and weighs 6 kg; the smallest, the least chipmunk, 22 cm and 50 g.
In Canada most species reproduce once annually. Mating occurs in spring; gestation lasts 24-44 days and litters average 3-8 young, depending on species. At birth young are hairless and poorly developed; growth is rapid. 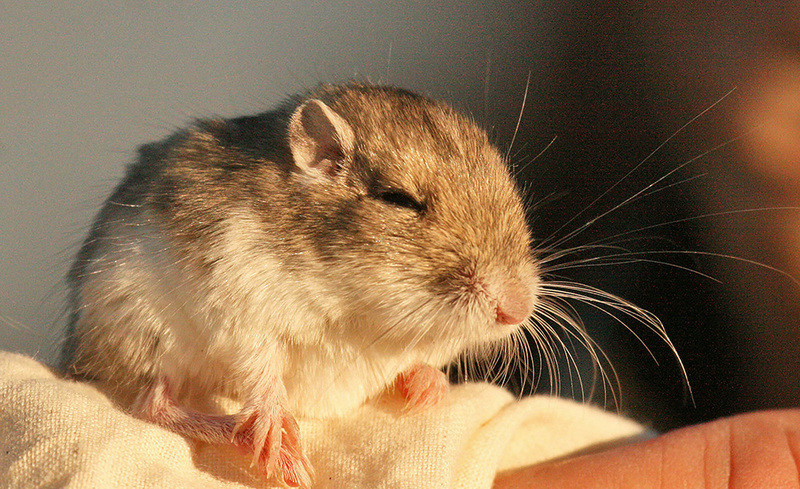 All Canadian species, except flying squirrels, are diurnal. While most ground squirrels hibernate, tree squirrels are active year round. Some are gregarious; others, solitary. 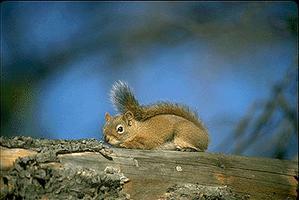 Tree squirrels generally build nests; ground-dwelling species dig burrows. Certain species of squirrels are found throughout Canada; others only inhabit specific areas. Preferred habitats are varied, including forests, prairies, mountains and arctic regions. Primarily herbivorous, squirrels sometimes eat insects, eggs and even small birds and mammals. Squirrels can damage cereal crops, maple-tapping equipment and telephone wires; burrows and hillocks can harm livestock and agricultural machinery. Eastern Grey SquirrelSee a description of the natural history and typical habitat of the Eastern Grey Squirrel in Canada. From the "Hinterland Who's Who" website. Also includes video clips, summaries of related conservation issues, and educational resources.